Earrings on long loops are a very early style, usually made from gold. Finds from the Mycenaean & Minoan cultures of the 14th and 13th centuries B.C.E. include an integral 'boat' decoration, whilst finds from Phoenicia dating from the 7th-6th century B.C.E. have a decoration applied to the base of the loop. 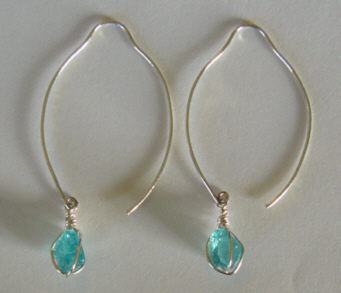 Plain loops - "hoop earrings" - remain popular in most cultures. 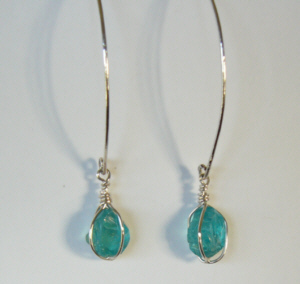 The loops are hand-forged on the premises from Sterling Silver, and the c. 0.9 gms of natural Apatite crystals have been hand-wrapped in Sterling Silver wire to best display their natural growth planes.